Each Robot Factory level provides 1 Robot Unit for your mines. Each Terteth Factory level provides 3 Robot Units. You can send these units into your mines with limitation of maximum 10 units per resource type. 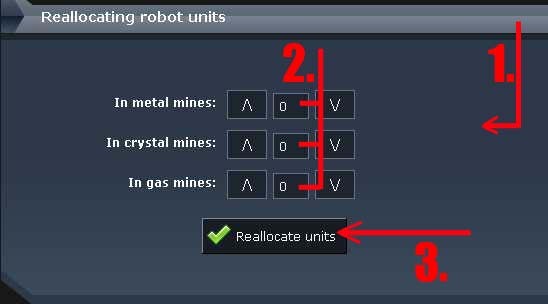 You can allocate or reallocate your Robot units according your current needs. Click with your mouse somewhere out of the field to refresh the actual count of the units. Then allocate the units as you like and save the changes.